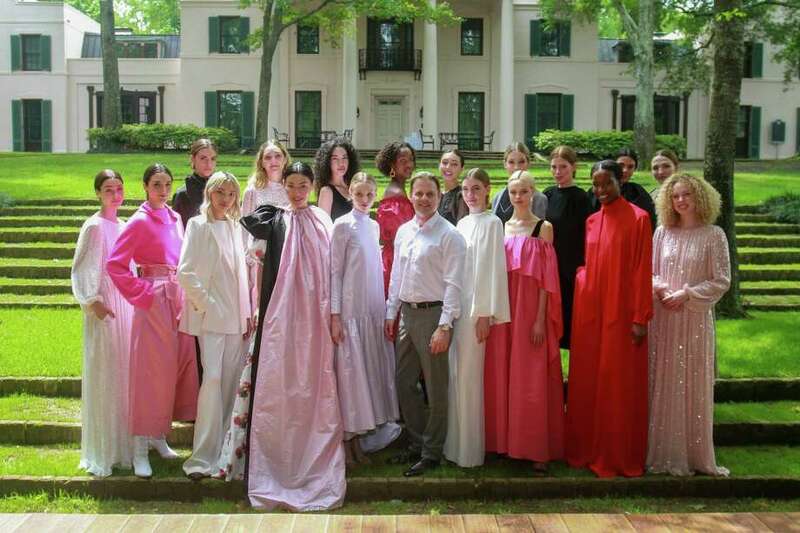 Designer Adam Lippes and models after runway show at MFAH’s Bayou Bend fashion show and luncheon. Fashion designer Adam Lippes feels like he’s been adopted by the city of Houston. A very chic den mother, Elyse Lanier, has taken him under her wing. Her nest of choice? River Oaks, and all the influence that comes with it. So last Friday, the ladies who luncheon flocked to Bayou Bend for the Museum of Fine Arts, Houston’s annual fashion show and luncheon, underwritten by Neiman Marcus, featuring the Adam Lippes pre-fall and fall collections. Some wore pearls, as is expected, while others seized the opportunity to break from the sartorial confines of country club dressing to walk on the wilder side. Jerry Ann Costa‘s neon Chanel suit, in shocking pink and orange, electrified the white tent erected behind Ima Hogg’s former home; the late doyenne, philanthropist and arts patron would have especially approved of Costa’s rainbow Gucci shoes. It was a perfect summation of what the designer does best: dressed up daywear. “My focus is sportswear, it’s not occasion dressing,” he told the Chronicle backstage before the runway show. Houston, with our robust social calendar, is very much an occasion town. Though fortunately, Lippes found an “in” when he met Allison Sarofim, who dug his designs, but knew instinctively that the relaxed aesthetic was more her sister-in-law Courtney Sarofim‘s style. So Courtney hosted Lippes at her home for his inaugural Bayou City trunk show, which is where he met her mother, Lanier, and the rest is family history. Like many of her friends who wore the designer’s label to lunch, Courtney dressed in pastel satin. She was quick to point out that one of her favorite looks in heavy rotation, a rust cotton blazer and matching flared trouser, was for sale inside the Neiman Marcus onsite pop-up shop. Despite the intimate crowd, more attendees than usual flipped through the racks and slipped into stalls to sample the goods. Posing in front of the Events Company’s massive wildflower wall was another big draw. The saffron backdrop was inspired by one of Lippes’ earlier collections. Stems Custom Florals’ centerpieces on each table tied the spring color scheme together. And just before guests took their seats for City Kitchen’s lightly Southern meal, Like many of her friends who wore the designer’s label to lunch, Courtney dressed in pastel satin. She was quick to point out that one of her favorite looks in heavy rotation, a rust cotton blazer and matching flared trouser, was for sale inside the Neiman Marcus onsite pop-up shop. Despite the intimate crowd, more attendees than usual flipped through the racks and slipped into stalls to sample the goods. Posing in front of the Events Company’s massive wildflower wall was another big draw. The saffron backdrop was inspired one of Lippes’ earlier collections. Stems Custom Florals’ centerpieces on each table tied the spring color scheme together. And just before guests took their seats for City Kitchen’s lightly Southern meal, Whitney Crane, wife of Astros owner Jim Crane, whisked through the venue with one high-profile entourage., wife of Astros owner Jim Crane, whisked through the venue with one high-profile entourage. Supermodel and new mom Kate Upton, who married Astros pitcher Justin Verlander days after the team’s World Series victory in 2017, caused a miniature stir as she, Kara McCullers, Daniella Rodriguez, Amy Cole and more made a stunning entrance. The women demurely took their seats, and then the real show began. Lippes’ sent 41 looks around the U-shaped catwalk. They were laid-back, yet luxurious. His clothes are swathed in French and Italian fabrics, but constructed in America. For the coming season, he sourced floral still-life paintings printed on expired 35mm film, and sprinkled the romantic pattern throughout the collection. Judging by the audience’s reaction, two silk taffeta gowns in yellow and lavender were big hits. Don’t call them “occasion” outfits, but a number of duchess satin capes and sequined gowns would hit all the right notes at MFAH’s upcoming Spring Rienzi Party, Glassell School of Art benefit gala or Sunday’s return to Bayou Bend for the al fresco Garden Party. The rest of the world may have adopted athleisure, but festive attire is how Houston was won. STAY IN THE KNOW: Get caught up on what’s going on around Houston. From sports to news and entertainment, check out the newsletters we’re offering.